“Brown is one of the “extreme groomers.” The fad has become a sport of sorts — more than a dozen U.S. competitions are held every year. Some of Brown’s most photographed dog work includes a zombie, sculpted over a year to look like exposed bones and rotting flesh, and a tribute to the Alabama football team that took more than four months to make. For the regular pet owner, birthdays are the most popular occasion for chalk-based makeovers, said Megan Mouser, groomer and PetSmart salon project manager in Phoenix. Sports team colors are also in demand, she said. 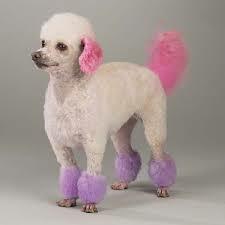 Some people feel dog dyeing is just innocent fun. After all, they argue – it’s not like the dogs are hut in the process. I personally stop short of condemning the practice outright, but feel that it creates an unhealthy attitude to pets. After all, dog are meant to be dogs – not color coordinated accessories. i believe grooming can and should work with the dog’s natural coat and health needs to create a coat which is both practical and therapeutic. A good cut would reduce hair coverage over eyes, ears and toes, where extra hair can cause health problems. The length of the hair should be chosen according to the dog’s environment: short for an indoor dog, longer for a dog living outside. And no, I don’t think dyes are a good idea. Even if dogs are mostly color blind, it’s the humans’ reaction which worries me most. Isn’t it cute to see your dogs well groomed? Dog grooming is very vital because the physical appearance of your dog influences the way he feels and the way we look at him as well. Remember, a clean dog is a happy and healthy dog!